On Second Scoop: Ice Cream Reviews: Why did Dunkin change my beloved Coolatta? Why did Dunkin change my beloved Coolatta? Look, I've been drinking Coolattas since they first came out. I don't remember exactly when I feel in love with the Strawberry one, but I remember them setting up on a Boston street and handing out free samples of the "new" coolatta in the 90s. I think my wife and I tried the vanilla bean one at the time, but I'm not positive. My point is it has been forever, and now, in 2018, they've finally gone and ruined the Coolatta. Why I ask, WHY? No, it's not totally dead to me, I will still get them on occasion, but the switch to a much finer ice particle has taken away the magic that was the strawberry coolatta. I can't tell you how many times that I would grab an icy cold strawberry coolatta to help with one of my headaches. Or how about those fun days where I would take a long walk to get one with one of their discontinued lunchtime sandwiches. Man Dunkin, you sure have wormed your way out of my heart. 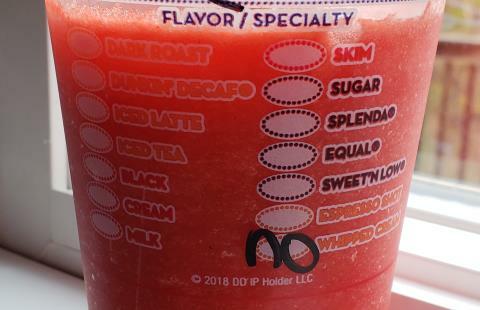 I now open the floor to anyone else who would like to vent about Dunkin, whether it's their coolattas or lackluster donuts or something missing on their menu. IMPORTANT UPDATE: Reader Meghan is right! You can still get a Coolatta the "old" way! I felt a little silly asking, but the very nice lady behind the counter was like "no no, I never use the new Oasis machine for coolattas". She made my beloved Strawberry Coolatta the way I love it and off I went on my drive home. Guess I need to be careful on all my future orders! I echo your sentiment about lackluster donuts. Even when they have the ones with specialty toppings, they seem stale. The glaze all too often seeps into the donut. The glaze on krispy kreme is far superior. The coffee is still fine, but I prefer starbucks overall. They reformulated a lot of the flavors to mix better in the Oasis machine versus the older Coolatta machines. The Oasis crushes ice and mixes with the base as ordered, versus the Coolatta machine. Its why they're "Frozen Coffees" now not Coolattas. @Anne: I need to find me a new reliable donut shop, speciality donuts just arent huge in this area (though they must exist somewhere). @Amanda: it makes me said how they've been on the slide for years. Since they switched to manufactured donuts (instead of made in store donuts), we've bought a lot less of them. it's just not the same. never thought they would break the coolatta though. I really hate change sometimes. @Megan: I need to be more observant and try to catch the new machine in action. I figured that must be something new going on so I appreciate the explanation. Any chance of finding a store that still does old coolattas?! I would ask them if they still have the Coolatta machines. I know here in central Maine most of them still have the Coolatta machine, and the newer machine. The Coolatta machine is similar to Slush Puppie machines. There's a base that constantly mixes, when you order, they do the correct amount of pumps for the order, fill the cup, and mix. The Oasis machine they do the flavor pumps/shots into the blender cup, and then pick the size on the machine and it crushes the ice and mixes.